Your choice of contractor has the potential to make or break your project. Make sure you choose an experienced contractor like Cabinet Magic for your Kitchen remodeling in Buena Park CA. Cabinet Magic is a licensed contractor with the skills and experience required to guide remodeling projects of any size or complexity to completion. We seriously care about client satisfaction and we will work hard to make sure you love your new kitchen. Kitchen remodeling in Buena Park CA sometimes requires a leap of faith as you go from your sample selections to the real thing. For example, you may worry that your flooring and countertop won’t complement one another like you’d hoped, or that the color you’ve chosen for your cabinets will be too dark once a whole wall of cabinetry is installed. At Cabinet Magic, we believe being able to accurately visualize your kitchen remodeling in Buena Park CA before work begins is key to being satisfied with the final result. That’s why we use computer rendering software to create detailed 3D images showing what the finished remodel will look like. This way you can see every detail and approve it before we begin work. Custom cabinetry really is a must for any high-end kitchen remodel. Cabinet Magic has been creating stunning custom cabinets right here in California for nearly 30 years, and we can make your design vision a reality. We offer a complete range of styles from modern to traditional, along with virtually any color of paint or stain you could want. We even offer custom crown molding for cabinets. Our cabinets are sturdily built to stand the test of time and incorporate high end features like soft-close hidden hinges and smooth drawer slides that make them a pleasure to use. 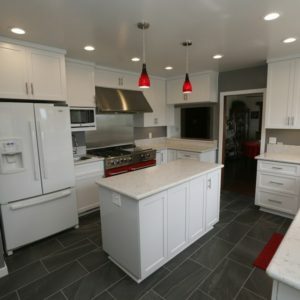 Take the first step towards beginning your kitchen remodeling in Buena Park CA today by contacting Cabinet Magic at 800-828-4380 and requesting your free in home consultation. We’ll be happy to share ideas and provide a free estimate for the project.